I'm back! Boy, the holidays really hit me hard this year; I haven't done much sewing, blogging, or really much of anything since Thanksgiving! I almost didn't post this one since it has been so long since Hallowe'en, but I had it mostly written and decided that I really wanted a log of the entire costume. If you're tired of seeing the same pictures that you've been seeing for the past two months, scroll down; I finally managed to post a few photos of my little one! 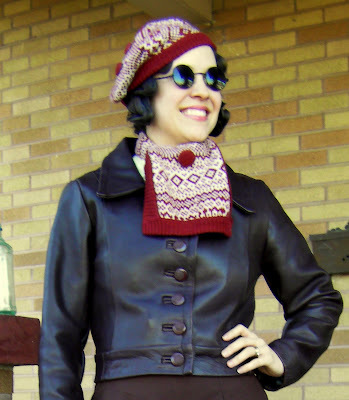 As I used real leather to make the coat, I really wanted to be able to wear it again. I used the leftovers from a huge thrift store coat that I had cut up to recover a chair cushion, so most of it was in pieces. I used parts of several different patterns to make it. I had to do a bit of improvising, as I needed to use the largest pieces for the sleeves, hence the panels in the bodice. I didn't take as many pictures of the process as I had thought, so I hope that you can see how it all went together . I was finally forced to do bound buttonholes; seven of them! I was terrified to do these in leather, as I don't have much practice with them in the first place, but I found that the stiffness of the material actually helped a lot. I had originally planned for the coat to have four buttons, but then I found these amazing vintage buttons on etsy, and I decided that I wanted to use more of them! 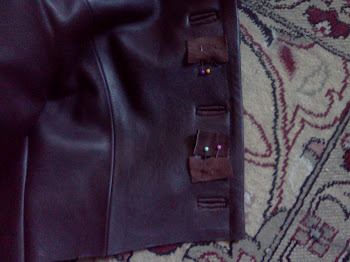 Luckily, it worked out that I could put another buttonhole between each one that I had already done; I had to lengthen the coat slightly to make the spacing right, but I think it still looks fine. And yes, I did use one of my son's blue crayons to do all of the markings. It worked like a charm and wiped right off! Putting on the waistband. Have you ever tried to gather leather before? I hadn't, and I hope that I never have to again! It does make the back look pretty, though. Here you can see how the waistband is pieced together, and how I couldn't quite make the seams on the bodice and the waistband match up. They match in the front, though, and it's really not noticeable when I'm wearing it. I still think that it turned out better than it would have if I had used a vinyl or some other cheaper material. 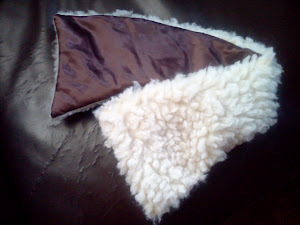 To make the coat more versatile, I wanted to make the sheepskin collar removable. I had this big piece of faux sheepskin that came home with us from the hospital when I had Henry and which has been sitting in my stash ever since. I cut out a piece the size and shape that I wanted it, and lined it with some brown satin. You can see how bad the bound buttonholes look from the inside in this picture. Don't look! Allow yourself to be distracted by the clever way the collar buttons onto the jacket! The lining was a pre-quilted acetate that I got on sale from my local fabric store. I was so proud of how the lining came out; I don't line things very often, and I really struggled to figure out how to put it all together. Especially the sleeves. Success! Here's what it looks like without the collar. Sorry for the quality of the photo; our camera broke last month, so it will be more of those old camera phone pictures for a while! This was an unseasonably warm day, so we decided to do some outdoor activities. 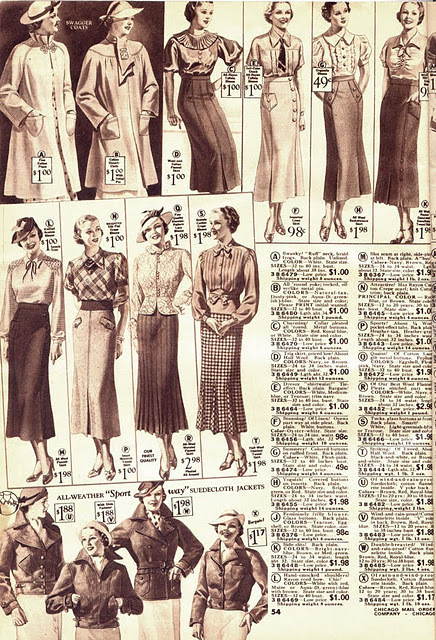 I was inspired by the jacket illustrations at the lower left of this advertisement. I'd love to have these sporty skirts and blouses, too, and especially that plaid sweater! 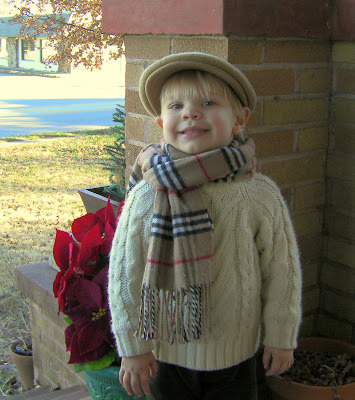 I made this little scarf and hat using a regular-sized scarf from Target. Making the sweater-covered buttons was a nightmare, but I think it was worth it. Here we are getting ready to go on a little hike. The hat is an adult hat that I found at Goodwill; I just put a seam up the back to make it fit his head. It does look a little big, but I think it works! The sweater came from a resale shop, and the scarf is mine. The shoes were white; I painted them brown using these Angelus Leather Paints. Worked like a charm! And now that the new year is here and I have finally finished talking about my Hallowe'en costume, on to other things! I've been working on my very first evening dress, which I plan to wear to a cousin's wedding in a few weeks. Since I can't seem to concentrate on just one project at a time, I've also been sewing a vest for my husband, a few more dresses for myself, and the cutest outfit for Henry to wear to the wedding, which I can't wait to share! That is amazing! I love the style and fit of the jacket, and I bet it keeps you nice a warm. 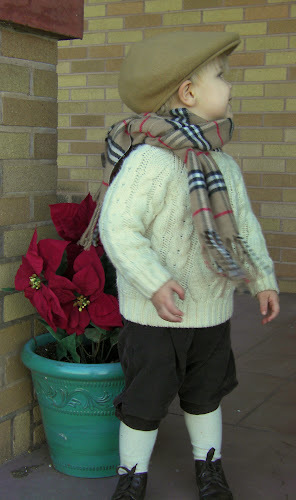 Your little guy is so dapper in his outfit ; ) The shoes are perfect. I applaud your ability, your style and your problem solving skills. Honestly 2 wonderful outfits from head to toe. Please do give your husband a thumbs up for the "girls tights" issue how thoughtful of him. Looking forward to seeing all your projects in the coming new year. Thanks again for sharing...I know it takes time. So lovely! Your little boy is SO CUTE!!! I haven't forgot about the award...I'm just a bit delayed ;) Hope you had a lovely holidays!!! GAH I love you! 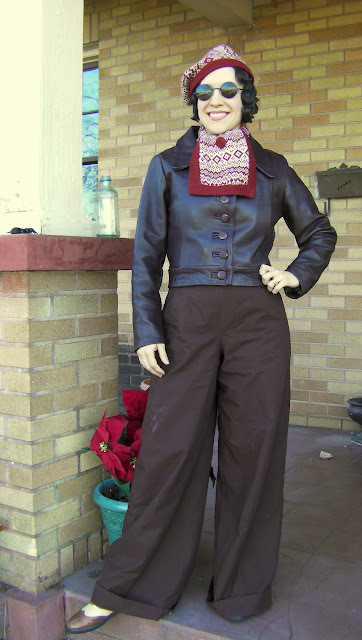 That jacket is fabulous, I love your aviatrix costume and I can't believe you put your boy in knicker-bockers...BEST. THING. EVER. He is adorable! I suddenly want a son just to put him in those. Haha. Need a bf first though...hmm. Holy smokes, that jacket is gorgeous. GORGEOUS. I've never seen a leather item so beautiful. My goodness that is a gorgeous jacket!!!! Everything in this post is wonderful and your Henry is so handsome! you make me want to learn to sew! Love seeing the little man! This is one of favorite outfits (ever!). Extremely adorable - I'm bookmarking this! Super cute and creative way to rework the jacket into your autumn look! I am totally and utterly in AWE! I'm in awe of each and every post you do! How adorable is little Henry!! What a cutie. You two look so lovely together. That jacket is fabulous, you are a clever lady. 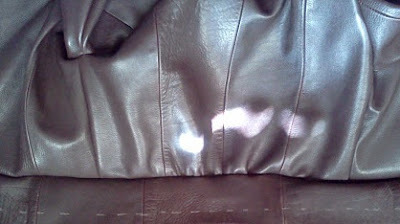 Wow, I still cannot believe you MADE a leather jacket. And little Henry looks utterly adorable. At first glance I thought it was Amelia Earhart. I am in love with that jacket and your sharp looking little man. Your new follower! :) Love it!